Sgt. Azariya sentenced to 18 months in jail over death of Arab terrorist. IDF sergeant Elor Azariya was sentenced to 18 months in prison Tuesday afternoon, after being convicted of manslaughter in January. The head of the judicial panel, Maya Heller, said that "the act of punishment is difficult and complex. We will do what is appropriate for the accused. The most severe punishment of 20 years teaches us the stringency of the crime of manslaughter. The facts are as they were determined during the course of the adjudication. We will detail the various acts and the appropriate punishment for the accused." Heller repeated the main reasoning for punishment as well as the character witnesses' statements that Azariya was an outstanding soldier who did not receive the proper treatment from his officers when he was suffering from emotional stress after the Hevron attack. "We heard that Azariya's commanding officers did not speak to him during the course of the trial and that the medical situation of his parents deteriorated." The judge also mentioned that the prosecution had claimed that "the fact that Azaria did not take responsibility for his actions should be taken into account...Azaria used his weapon for a forbidden goal but was in a complex situation." "The accused's behavior went against a number of values," said Heller. "The main value - the sanctity of life, is considered to be the most significant value. The accused also harmed the IDF code of purity of arms. In our opinion even in complicated situations, and maybe specifically in them, a soldier must be careful not to cause needless harm to human beings." The judge emphasized that during the attack in Hevron "the threat of the terrorists was real" and they intended to kill IDF soldiers. She stressed that there are various reasons to be more lenient towards the accused and to take circumstances into consideration. The judge said that even though these claims were dismissed during the course of the judiciary process they could be taken into account today when discussing Azariya's sentence. She added that "we could also take into consideration the period in which Azariya sat in confinement and acted commendably. It would have behooved the military commanders of the Kfir brigade to visit him during this period." Earlier Azariya entered the court and was received with cheers from his family. His mother, Oshrah Azariya, hugged him and said in a loud voice "bravest in the world, my boy, with an angelic smile". Charlie, Azariya's father, said to family and friends at the court: "We will accept the ruling. I request that nobody react to it. We love the people of Israel and all the soldiers here. I ask everyone here to exercise restraint." 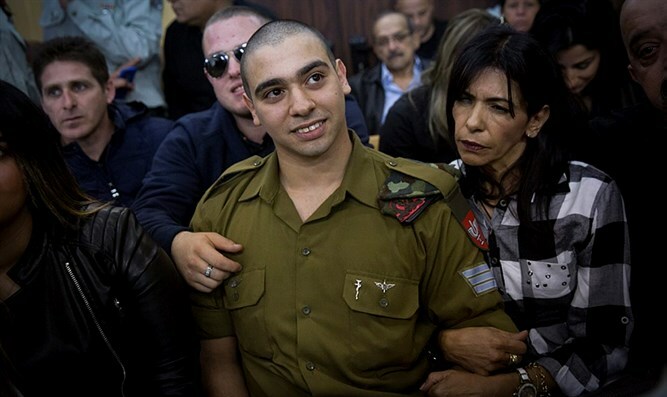 The prosecutor, Military Prosecutor Nadav Weisman had asked the court to sentence Azaria to between 3 and 5 years in jail and to lower his rank to private. The prosecution then requested a lower amount of jail time, closer to 3 years in jail. The defense demanded that Azariya be released and not serve a day in jail. They stressed that they would appeal even a lenient sentence and would request a delay in implementation of the jail sentence.